Want to discover even more live music and great events during your trip to Austin? Escape the hustle of the city for a side trip to the Gruene Historic District in the Texas Hill Country on the banks of the Guadalupe River. Shine your dancing boots or wear your flip flops and head on over to Gruene Hall, the oldest continually running dance hall in Texas. 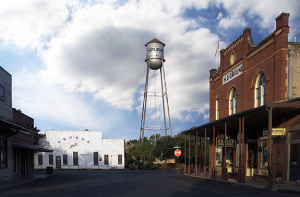 In the shadow of Historic Gruene&apos;s trademark water tower, the hall&apos;s modest exterior conceals a rich history. Its stage helped launch careers of Central Texas legends like George Strait, Lyle Lovett, Hal Ketchum and numerous others. Gruene Hall continues its tradition of hosting legendary and eclectic talent this summer, including upcoming shows from James McMurtry (6/8), Merle Haggard (6/21), Leon Russell (6/28) and a free July 4th show from The Damn Quails. If you can&apos;t make one of those shows, don&apos;t fret - Gruene Hall has live music every day! Don&apos;t just stay for a show when you visit Gruene. There&apos;s plenty to see, do and taste during your trip. Choose from a tube, raft or canoe when you beat the heat with a float down the Guadalupe River. Or you can heat up the dance floor with some swing dance lessons, hosted every Tuesday night all summer long at Gruene Hall&apos;s 15th annual series of Two Tons Tuesdays. If you work up a Texas-sized thirst during all that fun, drop by The Grapevine on the third Thursday of every month to meet some of the state&apos;s best winemakers and craft brewers - plus, they offer complimentary tastings daily. Sit on the river decks at The Gristmill River Restaurant & Bar and eat Texas favorites like chicken fried steak, juicy burgers and best of all, ice cold margaritas. You won&apos;t want to miss Fickle Pickles Antiques and Pickles, which offers an eclectic mix of historic wares and some of the most delicious homemade pickles you&apos;ll ever try. Don&apos;t worry if it&apos;s starting to get late. Spend a night at the Gruene Mansion Inn - the former residence of the town&apos;s founder, which has been converted into a bed and breakfast that maintains plenty of old Texas charm. When you wake up feeling refreshed and ready to go, make a stop at Gruene Hall&apos;s Gospel Brunch with a Texas Twist or Gruene Market Days before you head out of town. If you don&apos;t pick up a souvenir, you might think a place as great as Gruene was just a dream.